To make a reservation, please click the “Book Now” button or call us at 301-387-0111. All rooms have air conditioning and individual control of quiet hot water heat. All rooms have a flat screen HD TV and a DVD player, a Bose CD/radio/alarm clock with MP3 auxiliary adapter. Wireless internet connection is available throughout the inn. 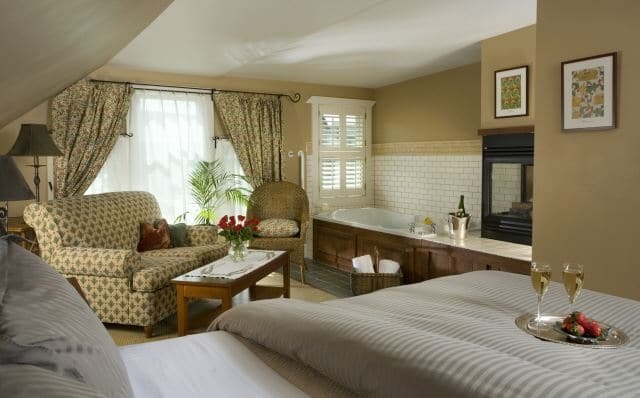 All baths include a hair dryer, 100% Egyptian cotton towels/bath sheets and Lake Pointe Inn Robes. Each floor has a coffee and beverage bar for early risers and late sleepers. *Holiday rates are the same as in season weekends. Are confirmed at the time of booking with a deposit equal to 1 nights stay. Balance will be charged to Credit Card on file 14 days prior to check in.If using gift card please call the inn to make reservation.No discount offers can be combined.Friday & Saturday nights must be booked together. Late Arrivals: Please call if you are going to arrive after 6 PM. No smoking or candles in the rooms. No talking on a cell phone in the common areas of the inn. CHILDREN: No children under the age of 18 years. For the sake of everyone’s serenity (and due to our thin walls in the beautiful 1890’s style building), we observe quiet hours from 11:00 pm to 7:00 am. Guests may use all the inn facilities including full bath and changing room, until mid-afternoon on their departure day. Lake Pointe Inn is an elite, resort-type property where every guest is important. Our goal is to offer a unique respite where you can experience rest, romance and relaxation. To provide you with the most enjoyable and stress-free encounter, we prepare for your visit, based upon your reservation commitment. When you book a room, we take that room out of our inventory and remove it from the market, thus ensuring your room will be ready and available for you when you arrive. Deposit: We guarantee your reservation, therefore, rooms cannot be held without a deposit. At the time of booking, a one-night deposit is charged in order to secure your reservation. You will receive an email with your confirmation. If you do not receive a confirmation via email, please contact us so we can assure that your reservation has been properly processed. To complete your reservation, and make your check-in hassle-free, the balance on your account will be charged 14 days prior to your stay. For reservations made less than 14 days in advance, we require the full balance. 1. To avoid your credit card being charged, please call 301-387-0111 or email Relax@deepcreekinns.com 15 days prior to arrival should a change in your reservation be necessary. 2. For regular rates, cancellations made 15 days or more prior to arrival will receive a full refund less a $50 processing fee per room reservation. 3. Rescheduling a reservation is the same as a cancellation and all cancellation policies apply. 4. When cancelling or changing reservations within 14 days prior to arrival, guests are responsible for the entire amount of their reservation. When cancelling or changing reservations within 21 days prior to arrival, guests are responsible for the entire amount of their reservation. Weddings will be considered on an individual basis. Please contact the inn to set up an exploratory meeting with the owners. 1. Do you require a minimum number of nights per stay? Weekends require a two-night minimum stay and three-day weekends require…well, you know, a three-night minimum. Sunday night is not considered a weekend night and may be booked for a single night unless a holiday falls on that day or it is part of a three-day weekend. Holidays and special event weekends may require a longer stay or have a higher rate and longer cancellation period. Please call if you require a single night on a weekend as occasionally we are able to accommodate an exception. 2. Do you take a deposit when a room is reserved? Yes. If the reservation is more than two weeks away (14 days), a one-night deposit is required. If you book within 14 days of your reservation, you will be charged the full amount in order to confirm your stay with us. 3. What if I need to cancel? You should consider your reservation as final. We understand that events may occur beyond your control, but our B&B is small enough that even one cancellation makes an enormous difference. We do adhere to a strict cancellation policy. Rescheduling is considered a cancellation even if you immediately re-book for a future stay. 4. Why can’t we cancel with 24 hours’ notice like we can at a hotel? Unlike hotels and airlines, we won’t overbook at our small bed and breakfast. Imagine your disappointment if you showed up for your room and were told, “Sorry, we gave it to someone else because they arrived before you did. When you book your room and put down your deposit, we take that room out of our inventory and save it for you. 5. What if we have to shorten our stay? When you book a room, we remove it from our inventory for the full duration of your reservation. If you leave earlier than anticipated, please understand you are still responsible for your full stay. 6. What if someone else books the room we had to cancel? We will refund your deposit less the cancellation fee. We charge a cancellation fee to cover our credit card fees and labor spent preparing for your arrival. Even if we refund your deposit, we still have to pay the credit card fees and pay our staff. 7. What if it snows and the Maryland State Police announce a highway weather state of emergency? In the event the State Police announce a highway weather state of emergency which prevents you from arriving for your reservation, a Lake Pointe Inn gift certificate will be issued to you.